Grant aboard a plane, which took him to the Komi Republic to see his grandfather’s grave for the very first time. 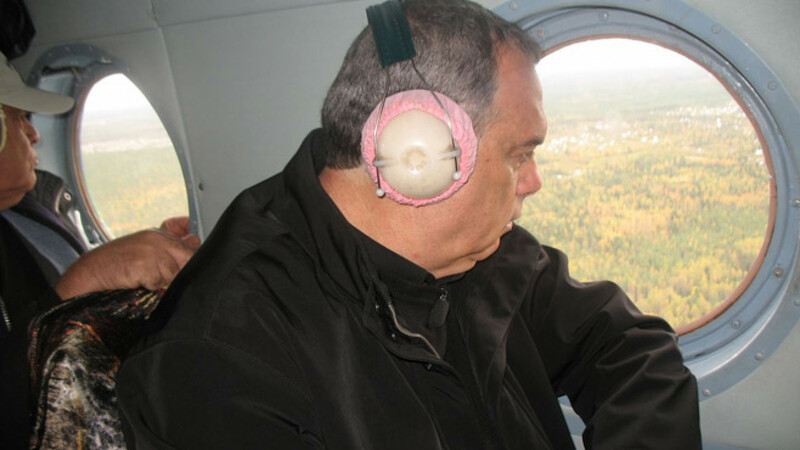 The Mi-8 helicopter flew over the never-ending taiga of the Komi Republic. We'd been passing over the green, gold and crimson tops of the trees for half an hour already, and there was nothing else: no roads, no cars, no rivers, no people. Only at such moments do you realize quite how vast Russia is. One of the passengers stared out of the window. A year and four months earlier, Avram Grant had led Chelsea to a Champions League final against Manchester United, but Russia for him was not just Moscow, where that final took place, but something immeasurably greater. Sometimes Grant closed his eyes and it seemed that he was sleeping, but he was thinking — thinking that one of the main goals of his life, something he had been determined to do since the age of 15, was soon to be achieved. One night he heard a terrible scream coming from the next room. It was his father, Meir, shouting out in his sleep at some nightmare. His mother was sick that day and for the first time in years she was sleeping in a different room from her husband. Grant realized that nightmares had tortured his father every night but that his mother had known instinctively when he was about to shout out: just a touch and he had woken up, the horrors receding. It had been going on for years and Grant had had no idea. Meir was an easy-tempered, lively, optimistic man. Sometimes he spoke briefly about his adolescence, and Avram heard about the mysterious land of Komi, where his grandfather, grandmother and two of his aunts were buried. But he had been sure that belonged in a distant past for his father. Meir, with his joyful nature, never made a cult of the past but lived for the present and the future. Only at night could he not control himself. After hearing his father scream that night, Avram vowed that he would find out everything about what had happened to his family — and find the lost graves of those relatives who were buried in far-off lands. And now he was flying to those graves. Two days before he had set off, Meir came out of a coma he had been in for seven weeks. Doctors had given him a 1 percent chance of recovery. This story is also about chance, which governs us all. I met Grant in May 2009 thanks to German Tkachenko, his friend and a well-known Russian football executive. The Israeli hadn't given a single major interview for a year since his hugely disappointing sacking from Chelsea, although dozens of British and Israeli papers and even The New York Times had asked for one. He just didn't want to speak and that was it. This time, though, for some reason he agreed. Before the interview, Grant didn't know me and he didn't know the questions. He probably thought that I would be talking only about football. As I was preparing for the interview, I pondered for a long time what I should begin with. A first question is extremely important for setting the tone of the whole conversation. Then I remembered the words of the Russian poet and musician Vladimir Vysotsky, that quarter of Israelis are "our former people," and decided to ask whether Grant had any roots in Russia. What if I hadn't remembered Vysotsky's quote? What if, knowing that Grant doesn't speak Russian, I hadn't asked the question, but had focused on something more urgent? What if Tkachenko hadn't introduced me to Grant? What if Grant hadn't agreed to an interview? After all, I was from neither his native Israel nor England, where he had made his home. But Tkachenko introduced us, Grant agreed to the interview and I asked the question. Everything coincided. During our trip to Komi, Grant often repeated that without that question, none of this would have happened. In his answer, he told me the story of the deaths of his grandfather and grandmother and added, "I've never been in Komi, and my dream is to go there one day and to find their graves." Grant couldn't have imagined that his dream would come true in just four months. The interview came out in the national daily Sport-Express on 22 May 2009 and on September 20 the old Russian TU-134 plane — "Are you sure we'll get there?" 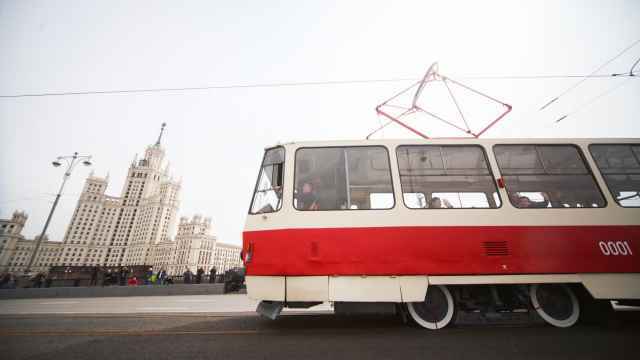 Grant asked when he saw it — took off from Vnukovo Airport with Grant on board, bound for Syktyvkar, the capital of Komi. A day later, Grant took his place in a helicopter, flying from Syktyvkar to a settlement in the Koigorodsky area called Rabog. It's a settlement that doesn't exist. Grant left his passport at the hotel, so at first staff in the VIP area of the airport in Syktyvkar didn't want to check him in. He offered his English drivers' license but the official on the desk asked how he would check in to return. It wasn't easy to explain that in Rabog there is no check-in, no airport. There is nothing. Nobody has lived there since the fifties, and the settlement doesn't appear on maps from 1956 onwards. In 1960, the last stables there were burned down because of an infection that had killed calves. In the seventies the occasional shepherd would build a hut there, but that was the last trace of habitation. By the eighties, as the Russian idiom has it, people had even stopped chasing calves there. The nearest populated area to Rabog is the village of Uzhga, 20 kilometers away. There is no road between them, just forest, forest and more forest. Grant pouring earth taken from holy places in Jerusalem on the burial site. Komi is vast. It's 24 hours by train from southwestern Syktyvkar to northeastern Vorkuta, the same distance as from Syktyvkar to Moscow. It wasn't simply a matter of going there and hoping to find a clue as to the location of the graves. When Grant and I, after returning from Rabog, visited the head of the republic, Vladimir Torlopov, I said to him, "Thank you for not being indifferent. All great things in this life happen because somebody is not indifferent." Torlopov couldn't be indifferent. His father was from Komi and his mother was Russian. His whole family was exiled to the wilderness during Stalin's regime. His grandfather and grandmother died there, as Grant's grandparents had. That, I guess, is why he took on Grant's quest as his own. The Komi republic was the first to include in its budget a separate section for remembering the victims of political oppression. In Syktyvkar, there are already nine volumes of the martyrology Repentance, listing the names of all those who died in gulags in the republic. One of them includes the names of Grant's relatives. Torlopov presented Grant with that volume and gave him the documents certifying his grandparents' deaths. On June 23, I received an e-mail from the press secretary for the Komi region, Konstantin Bobrov. A passionate football fan in his early thirties, he dedicated himself to finding the graves of Grant's grandparents and then organizing his visit to Komi. In less than three months we exchanged more than 50 e-mails and even more text messages as Bobrov told me about every step in tracking down the graves. First of all he went through the archives of registry offices and the Ministry of Home Affairs. He discovered that on 5 January 1941 somebody called Abram Ertselevich Granat had died in Rabog of myocarditis and that on May 31 his wife Ruda Granat had died of pneumonia. Bobrov asked me to check with Grant whether these people were any relations. He confirmed that his family had been called Granat before losing the second "a" and that his great grandfather was Ertsel. Moreover, Meir Granat remembered exactly the dates of his parents' deaths and they coincided with the data from the Komi registry office. After that it was only a technical matter to find the burial place. As Bobrov noted, one of the few advantages of the horror of the gulag was the strict bureaucracy. If anyone of spetspereselentsy ["special settlers," as they were called] disappeared, they would have been severely punished, perhaps even shot. That's why the archive contains documents about all 8,800 refugees from Poland who found themselves in Komi. But it is one thing is to discover the theoretical burial place, quite another to find it — especially in impassable taiga, where nobody has lived for more than half a century. The expedition had been organized. From Syktyvkar to Rabog is about 200 kilometers, or 50 minutes by helicopter. The first expedition sent by the Komi government went by jeep, but got stuck in the mud as the roads, such as they were, disappeared. What was meant by the term "road" in the north we learned the evening before our flight, driving half an hour to the borough of Chernam for a dinner in honor of Grant. In that area the Russian writer Sergei Dovlatov guarded prisoners. The well-known Israeli journalist Roni Daniel, who was covering Grant's journey with a film crew from Israeli television, a man with a stern face and an amazing sense of humor, looked at the roads and muttered, "Now I know why Napoleon lost." The first expedition completed the last 10 kilometers of the journey to Rabog on foot, walking through the forest and the weird mud. Thigh-high boots had been provided for us, but fortunately it was dry and they weren't needed. Our expedition was accompanied by old locals who remembered the way to Rabog and found a huge field where the settlement had once been. Nearby, they found a neglected graveyard. Only a fence, a wooden cross and shallow trenches where people were buried without coffins offered a reminder of what it had been. The grandparents of Avram Grant were among them. When you tread in this space, it's hard to find words to express your feelings. If no one of my family were lying there and I felt that, what must Grant have been feeling? Sometimes there are unbelievable coincidences. You already know about one of them: Meir Grant coming out of a coma just two days before his son's trip to Russia. You know about the second one: the similar fates of the grandparents of Grant and the head of the Komi administration. Here's the third. When Grant arrived in Syktyvkar, he was immediately told that the bodies of the parents of his former boss Roman Abramovich lie in the town cemetery. Abramovich's father was killed on a construction site when his son was a baby. Grant asked if he could see the grave. A friend of Abramovich's father, Yury Cheremisin, was quickly found and, carrying a large bunch of flowers, led us to the cemetery. As we chatted, it became apparent that Abramovich's grandparents had been deported to Komi from Lithuania in 1940 — the same year Grant's were exiled from Poland. The fates of the two Jewish families ran in parallel and almost six decades later their grandchildren met in London and almost won the Champions League together. I looked into the eyes of Grant. It was clear that after all the coincidences he was in a state of shock. When we flew to Rabog, it was other coincidences that concerned him. Grant's grandfather, after whom he was named, died in Komi at the age of 54; Grant was 54 when he visited his place of death. Grant's daughter was 13 when he made the trip, the same age Meir had been when his parents passed away in early 1941. Meir had dug their graves in the frozen soil with his own hands, then buried them. The historian Mikhail Rogachev, who travelled to Rabog with us, told us that the dead would, at best, have been wrapped in a sheet of material, but that usually there was nothing and corpses were put in the ground without any covering. Grant's son at the time was 15. At that age, Meir had been an orphan for two years, living at Rabog alone. He stayed there for another two years. Only he really knows how he survived. "He is the most optimistic and joyful man I ever met," Grant said. "He didn't have a choice, going to Komi or not. But he chose how to live beyond that. He could have gone into the shell of his memories and become gloomy and unsociable. But he had left the past in the past. Only in the nights was peace denied him." When, in 2001 Grant found in Poland the place where his family had lived before the war, Meir remained indifferent. The father grumbled at his son: "Why do you drag me into the past all the time? I want to live in the present and the future." But when the manager told his father in June 2009 that the cemetery with his parents' graves had been found in Komi, Meir couldn't believe his ears: any form of registration, for the living or the dead, seemed impossible in those conditions. But it was possible. And when Rogachev, who wore a baseball cap with the Champions League logo, told Grant, who was interested in every detail, what had happened at that time, the Israeli regularly exclaimed, "It's exactly as my father told me!" At first Avram didn't tell his father that he was flying to Komi. He decided that, two days after coming out of a coma, the excitement might be too much for Meir, even though he had fully regained consciousness. The next day, doctors allowed Grant to tell his father where he was. As he did so, his voice shaking, tears falling from his eyes, Meir asked simply, "Is it cold there at this time of year?" In winter in Rabog, the temperature regularly fell to minus 40 degrees Celsius, but there were no warm clothes for spetspereselentsy. There were no doctors. People there were dying in their hundreds, in their thousands. Grant and Baruch Finkelstein, chief cantor of St. Petersburg synagogue. The Grant (or rather Granat) family lived near Warsaw until 1939. The war forced them, like many other Jews, to flee to the east of the country, to Bialystok. Several weeks later it was occupied by Soviet troops after the Molotov-Ribbentrop pact divided Poland between the U.S.S.R. and the Third Reich. The border was immediately closed. The Granats didn't want to take Soviet citizenship. They wanted to go back home. But the Germans would not allow Jews to return. As Rogachev noted, ultimately that saved them, because if they had ended up near Warsaw they would almost certainly have ended up in the gas chamber. But, avoiding Hitler's hell, Grant's family in 1940 entered the hell of Stalin, the predicament captured by the start of Andrzej Wajda's film "Katyn" in which people running from the Nazi tyrant meet at the bridge people running from the Communist monster. Grant's father had nine brothers and sisters. One of them was killed in a bomb attack and two others disappeared — probably killed in a concentration camp. A fourth took shelter at a Catholic priest's house and, when he was found after the war, didn't know he was a Jew. Another brother and sister managed to escape and ended up in Canada and the U.S. Grant's grandparents, with Meir and their two daughters, 14-year-old Sara and 4-year-old Rachel, were packed with thousands of other Polish Jews in special trains and taken to Komi to chop down the forest. 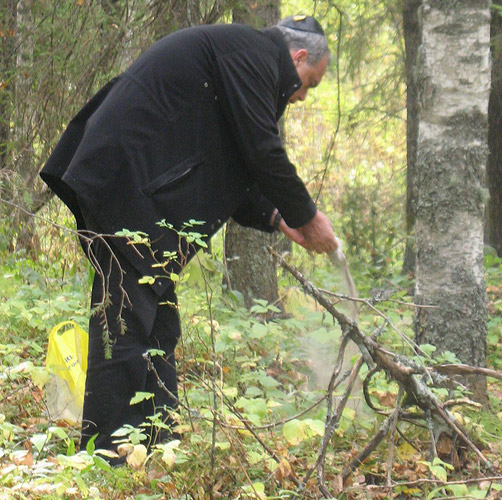 Locals were prohibited from contacting and helping spetspereselentsy but they nonetheless worked together and the people of Komi secretly taught them how to hold an ax correctly, how to cut trees and boughs. Meir Grant spoke kindly of these people, but it hardly mattered if they sweated their guts out for 10 hours a day waist-deep in snow if nobody could give them boots instead of their usual shoes. They had to wear light clothes in bitter frost. It's amazing that any of them stayed alive. Before September 1941 they were effectively prisoners. Later a partial amnesty was declared and theoretically spetspereselentsy could have moved to any town in Komi — but nowhere else. But how could they leave? On what would they travel? And where would they go? According to the rules, at least 100 families should have lived in such a settlement, but there were only a couple of wooden barracks. Each person was allotted an average of three square meters. The food rations were even worse. There was no provision made for children: let them die, the policy effectively ran; there was no use in extra mouths. Those who could work officially received salaries but only if they achieved a certain level of output. The threshold was set so high that even a strong man would have struggled to achieve it, never mind the exhausted, the starving and the sick. The only food available was flour. People boiled it, mixing it with the needles from conifers and sawdust. There was no river, so there was no clean water. Dysentery and other diseases became endemic and there were no doctors for spetspereselentsy. They gathered berries and mushrooms from the forest. But for people from the city that could be dangerous: Sara Granat died from eating a poisonous mushroom. 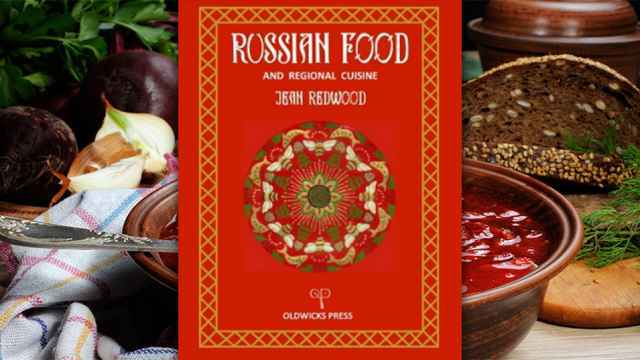 It's said that later in life Arkady Abramovich, the father of Roman, couldn't bear to look at mushrooms because that was all he'd eaten through those dreadful years. Meir Granat told his son that for every day of his four years in Rabog, he woke up and from morning to evening thought about food and looked for it. Most often it was in vain. When his parents died, Meir should by law have been taken to an orphanage. But the Jews did everything they could to prevent that: as Rogachev said, even if a kid had lost his parents, their friends would hide him. Meir lived alone from the age of 13 to 16. How did he live? How did he pass the days? How was he able to retain the belief that there would be a happy ending to the horror? Grant reflected upon that in the time we spent in Komi. "Now we know that it ended in 1944," he said. "But my dad didn't know that. I always tried to imagine him, a 13 year old, in that situation. And to understand how he managed to turn into an inveterate optimist with a great sense of humor." "'Everything that doesn't kill us makes us stronger,' as the famous quote says?" We passed through the enormous field and reached the graveyard. Grant asked everybody to leave him alone. He prayed for a long time. According to Jewish custom, he poured earth from holy places in Jerusalem onto the ground. He lit candles. He took a handful of Rabog soil as an act of remembrance. Did he cry? To me it looked as though he kept everything inside. "The guys from Israeli TV, who followed me through a camera, reported that I cried," he later said. "But I don't remember. I was thinking about my father and my dead relatives. I didn't feel whether the tears flowed or not." 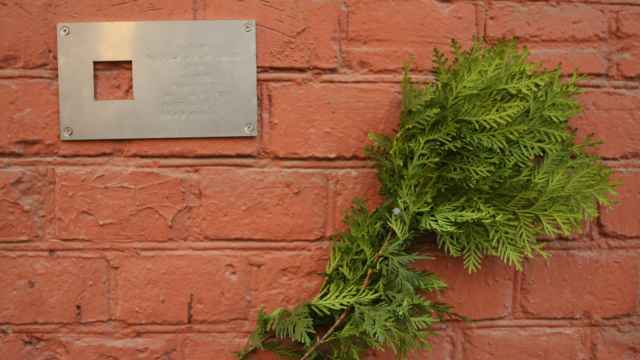 Later he and the chief cantor of the Moscow and St. Petersburg synagogues, Baruch Finkelstein, said a memorial prayer for each of his relatives who died in Komi and also a prayer for the victims of Nazism and Stalinism. The Grant family united both themes. 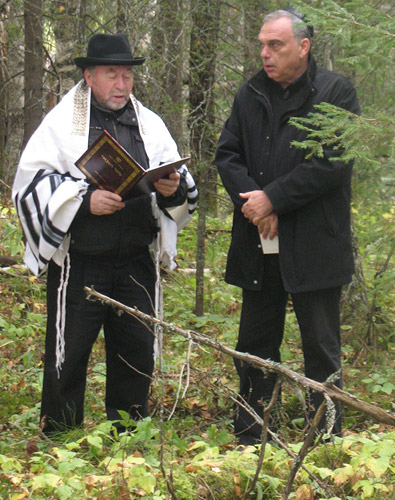 The Jewish prayer rang out in the middle of the Russian taiga. Israeli journalists shook their heads. Again and again, I caught myself during those days wondering at the feeling of unreality all around. "It's as if a load that I carried all my life has been taken off my mind," Grant said later. In the helicopter he immediately fell asleep. Rabog had sucked so much energy out of him that devastation came. The emotions came back so strongly that the next night he couldn't close his eyes. As soon as we got back to Syktyvkar, the rain began to pour as though it had delicately waited until the holy mission was fulfilled. During those two days Grant was busy. He spoke at a local Jewish cultural centre, where children dedicated beautiful dancing to him. He watched young footballers training and answered their questions. There were some tricky ones: "Was it hard to work with Abramovich?" Grant replied diplomatically. "You have to be proud that there is a man from these parts who has achieved so much," he said. "He should be an example for you that it's possible to achieve anything." Grant took part in an opening ceremony of an indoor football tournament between teams from orphanages, which was held in the excellent new palace of sports. One of the kids impressed him so much with his sincerity and artlessness that Grant wanted to invite him either to Israel or to an English Premier League game. After the visit Grant asked me about him dozens of times, but things have changed in the Komi administration. Vladimir Torlopov and his press secretary Konstantin Bobrov resigned and the new authorities didn't show any interest in making it possible for the boy to travel abroad. Why did Avram want to do that? Because his father also became an orphan very early and he never forgot that. He saw how his family, neither poor nor rich, always gave a tenth of its income to charity, as the Jewish tradition demands. It also demands that Jews should fight for their land and their freedom. In 1944, the surviving Polish Jews were allowed to move from Komi to Ukraine and, in 1946, Meir left by ship for Israel. The boat, though, was stopped by British authorities, and all its passengers were interned in Cyprus. "How it was there?" Grant asked his father. "Like a five-star hotel," Meir replied. When in 1947 he finally reached Israel, he went to Jerusalem straight from the ship to fight for independence. Soon, already in peace time, he met his future wife, a refugee from Iraq. And then a little later Avram Grant appeared on earth. In Komi he often said, "Thanks to football." What, I asked, was the connection to the game? The manager explained that if there was no football, there wouldn't have been an interview in Sport-Express. Then the head of the republic wouldn't have learned about Grant's family and wouldn't have started the search. And the passionate people who completed the process wouldn't have been found. "If your father fully recovers from his illness, would he want to go to Komi himself?" I asked Grant. "I know him and I don't think so," he said. "He never liked to live in the past. But he'll look attentively at the pictures and won't miss a detail from the story. But I'll bring my kids here for sure. Because I experienced here, in Komi, one of the most exciting moments in my life. I'll never forget it." Meir Grant never had the chance to go to Komi. A month later he passed away. But he had time to learn that his son found had the land where his parents were buried. Igor Rabiner is one of Russia's most famous football journalists. This article originally appeared in The Blizzard, a quarterly publication from a cooperative of top class football journalists and authors from across the globe. www.theblizzard.co.uk.